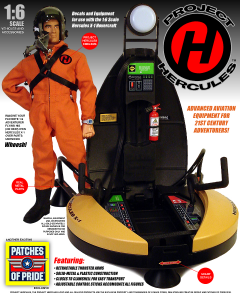 Last week I told you about the X-1 Project: HERCULES personal hovercraft, a new vehicle for GI Joe and his friends, aimed solidly at the customizer market. As promised, this week we bring more details. Project Hercules is the brainchild of Mark Otnes, the man behind Patches of Pride and The Joe Report, and he told me about the development of this cool toy, “The original concept for Project: HERCULES came to me a couple of years ago and I was going to release it about a year and a half ago. But I held back on introducing it because I wanted to finish the Magnificent 7 (photo-comic) storyline that introduces it first. Business picked up (yay! ), so the comic had to wait, and Project: HERCULES was sidelined. Finally, late last year, I realized that I was too busy to finish the comic (at least for now) and decided to just go ahead and release the first parts of the X-1 Project: HERCULES line now. From September, 2008, this episode features music from Jonathon Glen Wood and Civil State. We also have a promo video for “Jack The Ripper,” the musical by Mark Scarpelli and Dan Kehde, which opened the week this show was originally posted, and there’s some vintage campaign animation from 1960. “Our first musical guest is Jonathon Glen Wood, and I’m telling the truth. I really didn’t know he was a musician when we first met. I ran into him at Heathen’s bar in South Charleston where we both went to hear our mutual friends, Mark Bates and The Vacancies. Jonathon was kind enough to let me hide behind him when a rather inebriated woman who looked like Ed Asner decided I was her new boyfriend. Jonathan is based in Louisville now, but he recently returned home to play a show at kinship goods, and is still making wonderful music. It was revealed that a true unsung hero of pop culture passed away this week. Robert Kinoshita was 100 years old when he died last month in Torrence, California. 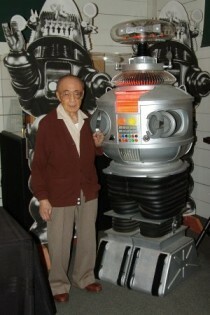 Over a five-decade career as a set designer, art director, production designer and producer on numerous film and television projects created numerous iconic images, sets and props, with the two foremost being Robot B9 from Lost in Space and Robbie The Robot from Forbidden Planet. These two mechanical men consistently rank among the most memorable movie or TV robots of all time, arguably they are the two most iconic robots in science fiction, prior to Star Wars. Born in February, 1914 in Los Angeles, Kinoshita was already working in the film industry when he was sent to an internment camp in Arizona during World War Two. After a stint as an industrial designer in Wisconsin after the war, Kinoshita returned to Hollywood in the early 1950s and made his mark as a set designer on Forbidden Planet. He also created Robbie The Robot, as an amalgam of several other designs by MGM’s art department and his own contributions. Two-Face is one of the most prominent villains in Batman’s comic book rogue’s gallery, yet he didn’t show up on the 1960’s television show. It turns out that he almost did, and it might well have been the most memorable episode of the series. 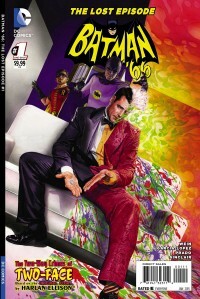 Famed writer, Harlan Ellison, who was then lending his talents to episodic television, wrote a treatment for a screenplay that would have introduced former District Attorney, Harvey Dent, and his split-visage to television viewers. The episode had been greenlit, but before work progressed on a full script, the American Broadcasting Company (that’s ABC to you and me) pulled the plug. It seems the network censors felt that a character who had half his face horribly scarred when acid was thrown at him was just too grotesque for a show that had a huge kid’s audience. The treatment went unread by the general public until Ellison published it in Brain Movies #5, a collection of previously-unseen movie and television pitches that also included his rejected ideas for episodes of Rat Patrol and Logan’s Run. We have a cool new entry into the world of ReMEGO action figures–The Sea Ghost. MEGO action figures were eight-inch tall colorful dynamos that ran kids’ imaginations wild in the 1970s. MEGO held the rights to both Marvel and DC, as well as dozens of other properties like CHiPs, Tarzan, Conan, The Dukes of Hazzard and even Happy Days and The Waltons. While the company shut down in the 1980s, in recent years the “ReMEGO” movement has sprung up, with new companies producing figures reminiscent of the scale and scope of classic MEGO. One of the coolest things about the “ReMEGO” movement, is that there are so many companies making MEGO-style figures that, not only are we getting treated to a wide variety of different characters, but also the competition between the companies means that they’re all doing their best to improve their quality. Most ReMEGO figures are worlds beyond the quality of the original MEGO line. Week ten of Radio Free Charleston on New Appalachian Radio features two hours of new and archival music that celebrates the diversity of Appalachian music. If you read that to mean that your host was too lazy to come up with a theme for this week’s second hour, congratuations on your perceptive abilities. Update: You can listen to this show now in the Voices of Appalachia archive HERE. 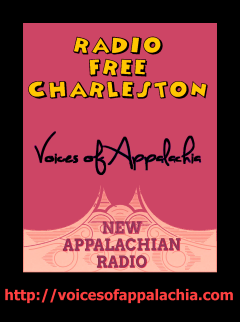 You can listen to Radio Free Charleston’s streaming radio incarnation at 10 AM and 10 PM on Tuesdays (and again at midnight Thursday and 2 AM Saturday night) at New Appalachian Radio, part of Voices of Appalachia. If you miss it, check our the archives for previously-aired shows. This week our music runs the gamut from the indescribable genius of QiET to Rootsy Blues, Modern Lounge, Raw Punk, Heavy Metal, Folk Rock and beyond. The instrumental music played at the very end of the show is by Frank Panucci, who also supplied the background music for this episode. With no theme, we will not be dividing out playlist into separate hours. Again,if you read that to mean that your host was too lazy to divide the playlist for this week’s show, congratuations on your perceptive abilities. This week The RFC MINI SHOW features Dublin native, Anthony Hoey, who made his Radio Free Charleston debut last November, seven years after we’d initially met. Anthony was living in Charleston in 2007, during the early days of RFC, and we kept trying to get our schedules together, but it never happened, and he departed for a series of worldwide travels that took him to The West Coast, New York City and back to Dublin, Ireland. Last year he found himself back in Charleston, and we reconnected at Third Eye Cabaret, where the footage on this show was shot back in November. 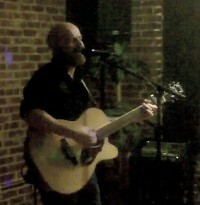 You will hear Anthony performing his original songs, “Dot on the Horizon,” and “When I Met You.” Audio engineering was providing by Eric Meadows, of Voices of Appalachia. You can listen in on a live broadcast of Third Eye Cabaret every other Thursday over at New Appalachian Radio, which is also the home of Radio Free Charleston’s “Volume Three” audio incarnation. You may also recognize Anthony from the great profile piece that Bill Lynch wrote about him last week in The Gazz. This week’s artistic appetizer is digital painting, a semi-abstract exercise in color and negative space being used to suggest a narrative. 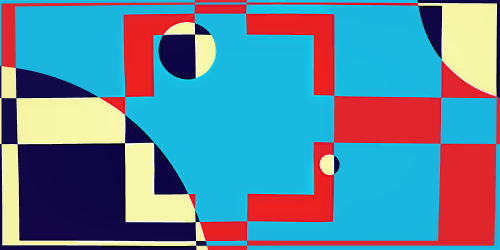 There isn’t really one, but if you stare at it long enough, you may come up with one on your own. Maybe you shouldn’t ought to try this at work. Click to enlarge. Later this morning look for The RFC MINI SHOW starring Anthony Hoey. This week we’re going to bring you three of the most-watched music videos produced for PopCult this year. Above you see The Laser Beams with their salute to West Virginia Attorney General Patrick Morrisey. This video gets a bump every time he winds up in the news. Unfortunately for West Virginia, that probably means that this video will pass 1,000 views sometime during the next Legislative Session. Below we have Farnsworth, with “20 Days,” a video tribute to the classic German rock music show, Beat Club. And below that we have a video from 2013 that was actually viewed more in 2014, “First Flight,” by Spencer Elliott. While this marks a return appearance in Sunday Evening Videos for our first two entries, I was surprised to learn that I’d never showcased Spencer’s video here. In fact, while “First Flight” appeared in Radio Free Charleston 195, I’d never posted the stand-alone video here in PopCult until last August, some fourteen months after we shot it. This is the first Saturday edition of The PopCult Toybox, and it’s going to be a short one. It’s just a bit of a tease, actually. Next Saturday we’re going to bring you a detailed interview about Project Hercules, a really cool new customizable 1/6 vehicle project brought to us from the folks at Patches of Pride. This week we’re just going to tease you with a few cool images about this new GI Joe-scale 1-man Hovercraft (not a working one, but it looks way cool). Check back next Saturday for the full story on Project Hercules.